Strawberries - This is our principle crop. We have been raising this crop since 1939. The season begins around June 15th and finishes around July 10th. We raise about 20 acres on our farm. 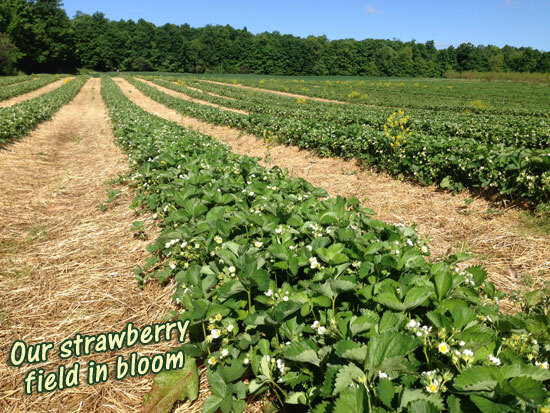 We sell our pick-your-own berries by the pound or freshly picked berries in the farm store. Bring easy to carry, shallow containers to pick in. We also have buckets you can purchase and take home. It's always a good idea to call ahead for picking conditions. Strawberries are easy to freeze, good for preserves, or for eating fresh and in recipes. Sweet Cherries - Just like candy! We have about 10 acres of sweet and juicy cherries. We grow the "Bing" type which are dark black in color and very plump. We ask that you bring your own containers for picking, but as always, we have buckets for sale. We provide ladders to use, but most of the time you can pick from just standing on the ground. Cherries are in season roughly from July 4th through July 20th. They are very easy to freeze - just pit and freeze. (Grisamore Tip: Don't thaw them out completely - they are best eaten "crunchy".) The cherry orchard is located on the north side of Goose Street. We occasionally have ready-picked cherries at our farm store. Sour Cherries - unlike the sweet varieties which are best eaten out of hand, sour cherries, due to their tart taste, are best used for cooking, pies, jellies and jams. They are easy to freeze for later use. For best results, pit and mix with sugar before freezing. Sour Cherries are usually ready for picking around July 10th. Raspberries - One of our favorite fruits, nothing compares to fresh-picked raspberries - they are delicious! We raise 10 acres that are ready to be picked from July 5th to July 25th. Like most of our other crops, raspberries are sold by the pound. Due to their being fragile and their relatively short shelf-life, we recommend that you pick them in small containers and consume or use them in recipes within a couple of days. Most days you need to go to the farm store to check in for picking raspberries. We usually have fresh-picked raspberries in the farm store. We also recommend that you freeze them "as is" and then wash them as you use them - this prevents them from getting soggy! Blueberries - Are ranked number one among fresh fruits and vegetables containing antioxidants that demonstrate anti-aging potential. Antioxidants are natural substances found in fruits and vegetables that neutralize free radicals, which are unstable oxygen molecules associated with cancer, heart disease, and the effects of aging. We have over 20 acres of blueberries to pick, starting around July 15th until September 1st. Blueberries are easy to freeze - treat them the same way you would raspberries. Wash after freezing. As with our other crops, these are available in the farm store. Currants - We have a long row of red currants near the blueberry bushes. We are also planting the black variety of currants. These are popular for making jelly and are usually mixed with strawberries to add more sweetness. They are ripe around July 20 - about the same time as blueberries. Peaches - One of our newest crops, we have an acre of this delicious fruit. We grow many varieties so we have peaches ready from about the end of July to the first week in September. There is nothing like homegrown peaches. We pick them when they are just about ripe so they are very sweet. Peaches are easy to freeze. As with any fruit, we prefer not to thaw them out all the way for the best flavor. Due to the fragility of peaches, they are not available for u-pick. Tomatoes - Tomatoes are high in vitamins A and C and are a good source of potassium. You can purchase tomatoes in quantity from by the pound all the way up to bushels. We grow about 1 acre of tomatoes every year. We have both regular and paste tomatoes. Paste tomatoes are meatier and don�t have to be cooked down as long when making sauce. We have them available in our store August 25 thru September 30th (depending on the season). Tomatoes are usually not available for U-Pick. Sweet Corn - We usually plant 2 acres of sweet corn every year. Corn is one of our favorite parts of summer. It is best when it is eaten the same day it's picked. We always pick our corn fresh everyday. It can be frozen easily. We usually have corn for three weeks around August 25. Peppers - Peppers are high in Vitamins A and C. They are good stuffed, in salads, in sauces - the possibilities are endless! Peppers are very easy to freeze. You just need to wash them and cut into desired size. We recommend that you double bag them to prevent the pepper smell getting into other items in your freezer. We have peppers available August 15th through September 30. Sorry, peppers are not available as U-Pick. We also have a variety of hot peppers, too. Hardy Mums - Do your flower beds start to look tired in August? Fall mums will renew your beds. They will provide some new color for the fall. Fall mums are not always "hardy". Plant your mums in a sheltered spot and mulch them during the winter to help your mums survive the winter. There are a wide range of colors to pick from. We have mums blooming from July 25th through September 15th. Apples - One of our relatively new crops - planted in 1978, we have 15 acres of apple orchard. Bring the whole family out for picking starting September 15 through October 31. We provide ample picking bags or you may bring your own bags or baskets. We also have carts available to help you transport your apples from the orchard. Feel free to bring your own wagon with you from home, as fall is our busiest season. We usually have picked apples available in our farm store through Christmas. Apple Cider - We press our cider right here on our farm from apples we grow. Cider is very good for you. One of our favorite ways to serve cider is hot. We like to put a gallon in a large pot and heat it up with some mulling spice for some extra flavor. Want cider all winter long? Cider is easy to freeze. Just pour some of the cider off the top of the jug and put it in your freezer. It is excellent! To make our cider safer, we are installing a UV light this fall. This will kill any possible bacteria in the cider without changing the flavor. Cider is available in our farm store September 25th thru December 10th. Cucumbers - We grow about one third of an acre of cucumbers. We grow both slicing and pickling cucumbers. Pickling cucumbers are best for making pickles of all kinds. But we prefer pickling cucumbers to eat fresh because the skin is thinner and they are usually not bitter either. Cucumbers are best fresh-picked. We usually pick them every other day so they are fresh.